H. Rick Bammman - hbamman@shawmedia.com Richmond-Burton's Hannah Condit takes a shot. 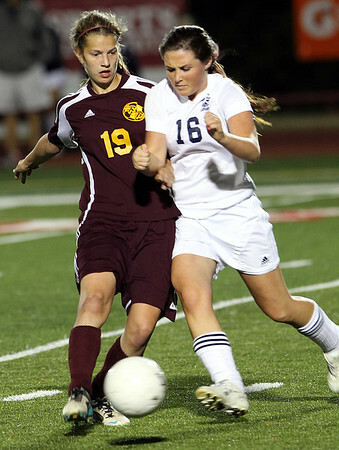 iRichmond-Burton's Miki Winkler (right) battles Quincy Notre Dame's Shannon Foley for control in the first half. 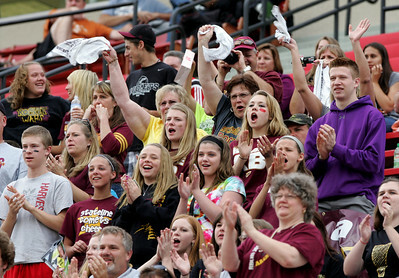 H. Rick Bamman - hbamman@shawmedia.com Richmond-Burton fans cheer the Rockets during the first half of the IHSA 1A State soccer semifinal game against Quincy Notre Dame. 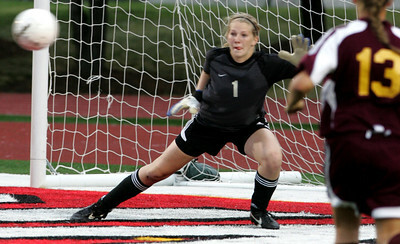 iRichmond-Burton's keeper Hannah Koenig moves to block a shot in the first half n the IHSA Class 1A State Final Friday May 25, 2012 at North Central College Benedetti-Wehrli Stadium in Naperville. 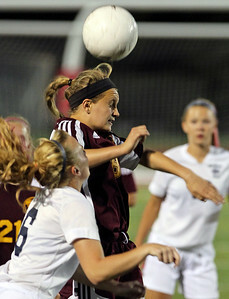 H. Rick Bammman - hbamman@shawmedia.com Richmond-Burton's Savannah Schinto helps to defend late in the second half. 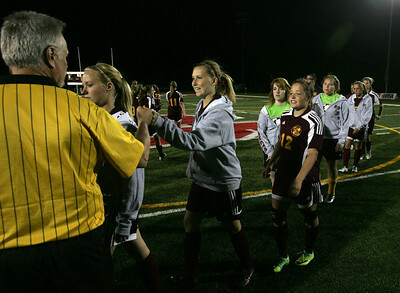 H. Rick Bamman - hbamman@shawmedia.com Richmond-Burton soccer team members thanks the officials. 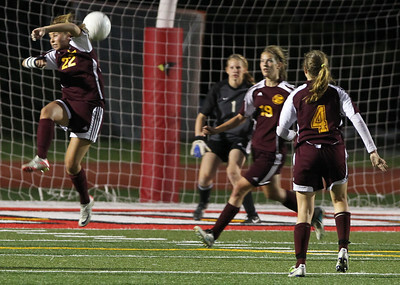 iRichmond-Burton's keeper Hannah Koenig can not block the rebound as Quincy Noter Dame scores in the first half n the IHSA Class 1A State Final Friday May 25, 2012 at North Central College Benedetti-Wehrli Stadium in Naperville. 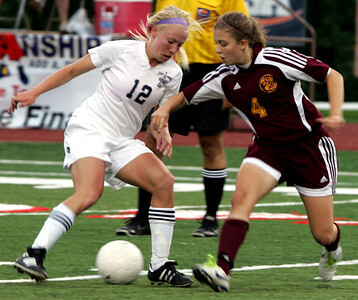 H. Rick Bammman - hbamman@shawmedia.com Richmond-Burton's Amanda Hoglund (8) heads the ball past Quincy Notre Dame's McKenna Murphy (6) in the second half during the IHSA Class 1A State Final Friday May 25, 2012 at North Central College Benedetti-Wehrli Stadium in Naperville. H. Rick Bammman - hbamman@shawmedia.com Richmond-Burton's Sam Boettjer (19) is challenged by Quincy Notre Dame's Miranda Stromquist (16) in the second half during the IHSA Class 1A State Final Friday May 25, 2012 at North Central College Benedetti-Wehrli Stadium in Naperville. H. Rick Bammman - hbamman@shawmedia.com Richmond-Burton's Miki Winkler (4) moves the ball upfield in the second half during the IHSA Class 1A State Final Friday May 25, 2012 at North Central College Benedetti-Wehrli Stadium in Naperville. 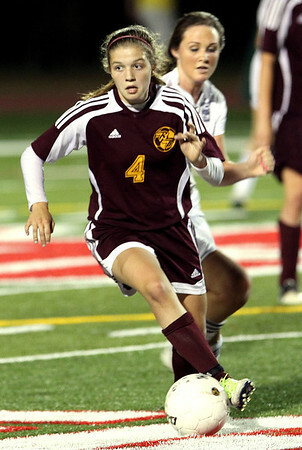 Richmond-Burton's Savannah Schinto helps to defend late in the second half.